The TER route will link Dakar with Blaise Diagne International Airport, via the new rapidly developing business centre of Diamniadio. ” Every carriage in this dual-mode electro-diesel train has air-conditioning and Wi-Fi. The people of Senegal deserve to travel in comfort and safety, and to save both time and money,” Sall said. Senegal is the second country in West Africa, after Nigeria, to adopt a dual-mode (electric and diesel) mass rail transit system. 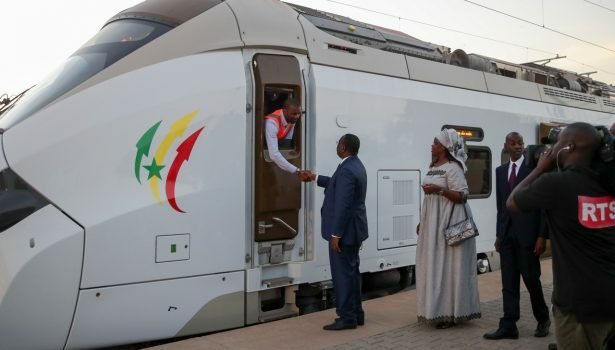 When the Regional Express Railway becomes fully operational, it will take just 35 minutes to travel from Dakar to Diamniadio, half the time the 55-kilometer road trip currently takes during peak traffic hours. With a population of approximately three million, Dakar is home to 25% of Senegal’s total population. An efficient, safe and fast mass transit system, is a strategic response to the development challenges of the Senegalese capital.